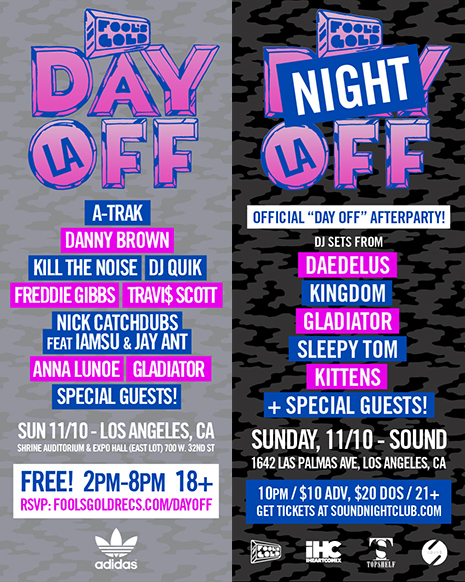 Fool’s Gold Day Off LA & Night Off Afterparty This Sunday! Cali we’re coming! Last year’s DAY OFF LA was so insane that we had to return with an even crazier lineup. Sunday (11/10) we’re bringing A-Trak, Danny Brown, Kill The Noise, DJ Quik, Freddie Gibbs, Travi$ Scott, Nick Catchdubs feat IAMSU & Jay Ant, Anna Lunoe, gLAdiator and more to the Shrine Auditorium and Expo Hall (East Lot) in Los Angeles from 2-8pm. Free with RSVP at foolsgoldrecs.com/dayoff while it lasts, so act fast (and get there early, admission based on capacity and RSVP does not guarantee entry). It’s only right that we keep the vibes going with another mega NIGHT OFF afterparty too! Get your tickets now to come check Daedelus, Kingdom, gLAdiator, Sleepy Tom (in his LA debut! ), Kittens and more put it down starting at 10pm.